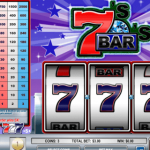 Seven and Bars is a 3 reel /1 payline slot game developed by Rival. It is a classic slot in the most true sense of the word. 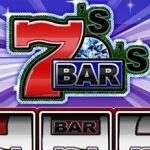 When you think of slot game this is really the type of game that comes to mind for better or worse. The jackpot is 2500 coins and at a max coin of $5 that’s not that bad for a classic! No Wild or scatter symbols in this game so no bonus features. 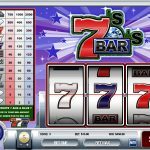 Whether you like it or not really depends on your liking of classic slot games. This one at least has a very nice jackpot so if this is something important for you then go ahead and give it a try. If you’re a francophile then maybe you should consider playing Red White & Blue a 3 reel slot by Rival.